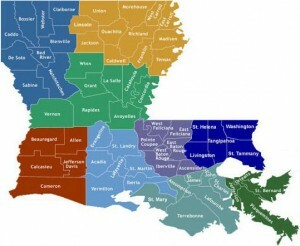 Our primary service areas are the North and Central Louisiana Parishes of Allen, Beauregard, Bienville, Catahoula, Concordia, Caldwell, Claiborne, East Carroll, Franklin, Grant, Jackson, La Salle, Lincoln, Madison, Morehouse, Natchitoches, Ouachita, Rapides, Richland, Sabine, Tensas, Union, Vernon, West Carroll, Winn and surrounding communities. We can and do expand our service areas Statewide depending upon the species and circumstances. Trapper J will take care of wild animals that damage your home and property, threaten you, your children or your pets, and bring disease and parasites into your home, such as: raccoons, bats, birds, bobcats, coyotes, skunks, moles, rats, gophers, squirrels, beavers, armadillos, mice, snakes, opossums, feral cats, feral hogs, fox, otters, hornets, wasps and honeybees. We are the ones you want to call to protect you, your home, and your property and provide Nuisance Wildlife Animal Removal.